Arthritis is wear and tear of the joint. The information here deals mainly with arthritis of the finger (knuckle) joints. Arthritis of the thumb and arthritis of the wrist are covered individually. There are two main types of arthritis that can affect the finger joints. Osteoarthritis is a slow process that develops over many years. With this type of arthritis the joint cartilage gradually roughens and becomes thin. The bone underneath thickens and the bone at the edge grows outwards causing bony spurs (osteophytes). The joint may swell as the body makes extra fluid to lubricate the joint. The joint may get deformed and there will be gradual loss of movement. Inflammatory arthritis includes conditions like rheumatoid disease or psoriasis. The most common cause of osteoarthritis is wear and tear of the joint due to ageing. This is called ‘primary osteoarthritis’. Sometimes a major injury (fracture, dislocation) to a joint may lead to osteoarthritis in later life and this is termed as ‘secondary osteoarthritis’. Arthritis in the joints of the finger is most common. The end joints of the fingers (DIP joints) are most commonly affected. In rheumatoid arthritis the arthritis spreads throughout the body. In this condition the patient’s own immune system mistakenly attacks the joints causing damage to many joints in the body. The symptoms of primary osteoarthritis start in middle age. They are of gradually increasing pain and stiffness. This is followed by difficulty in straightening or bending the finger. Firm to hard swellings may form over the end knuckles due to the underlying spurs (see picture above). 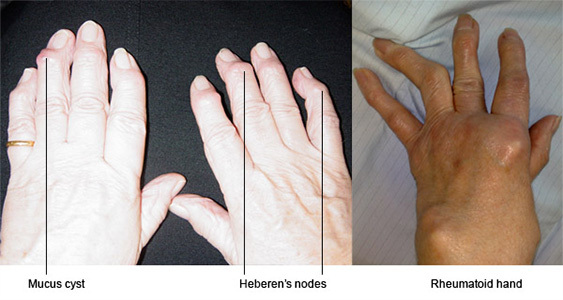 These are called Heberden’s nodes. They can be unsightly and sometimes painful. Cysts may form over the end knuckle joint. These are known as mucus or myxoid cysts. The cysts can become inflamed, painful and may intermittently discharge. With time the symptoms may worsen and cause functional disability. 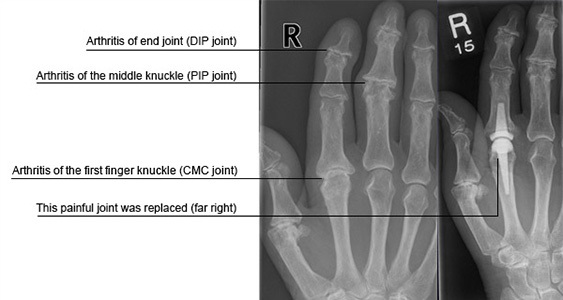 Functional disability will depend on which knuckle joint is affected. The fingers can be damaged by rheumatoid or psoriatic arthritis at any age. With rheumatoid disease there may be other problems due to synovitis (inflammation of the soft tissue lining over the tendons), tendon ruptures, or joint instability and deformity. An x-ray of the hand is needed (as below). It will confirm the extent and type of arthritis. X-rays will show lost joint space with bony spurs (osteophytes), cysts and bony sclerosis. Initial conservative management consists of painkillers, anti-inflammatory medication and activity modification. It is aimed at easing the pain and regaining further range of motion. A steroid injection in the affected joint may relieve symptoms. The injection very occasionally causes some thinning or colour change of the skin at the site. Improvement is variable and can be temporary. If the above measures fail, then surgery is advised. There are various operations that can be considered. The type of surgery that will be recommended will depend on the nature and longevity of the symptoms, extent of arthritis, the knuckle joint affected, age and functional demands of the patient. Excision of Heberdon’s nodes or mucus / myxoid cysts: If the nodes or cysts are painful, excision is recommended. The procedure is practised under local anaesthesia as a day case. After the operation a sticky dressing is applied over the surgical wound. A bulky supportive cotton-wool dressing then goes on top of that. This supportive dressing is reduced after a couple of days. The small sticky dressing should be left for 10 -12 days, after which time the stitches will need to come out. The arm should be kept elevated after surgery for 1-2 days as this will prevent the fingers from swelling and causing discomfort. Light use of the hand should be possible from the day of surgery. Active movements of the finger are recommended soon after surgery. Fusion of the affected joints (DIP or PIP joint): If the end or middle knuckle joints continue to be painful, fusion of the joints is considered. A successful operation will get rid of the pain, movement of the joint will however be lost. This is the surgery of choice for painful end-joint finger arthritis. 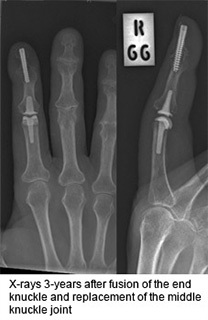 Fusion is also usually considered for middle-knuckle arthritis though replacement of that joint is an alternative (see x-ray below). Fusion will be achieved by using plates, screws or wires. Joint replacement surgery (PIP or CMC joint): In the last decade there has been a significant progress in joint replacement surgery. 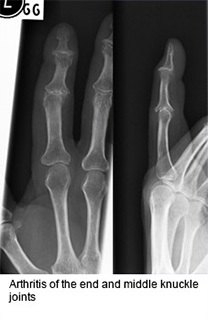 Painful arthritic first knuckle joints are best treated by joint replacement (see x-ray above). Medium to long-term results are encouraging, and movement of that joint is maintained. The joints are made out of pyrocarbon which is the same material used to make artificial heart valves. Middle knuckle joints can also be replaced (as in the picture below) but joint replacements cannot be performed if the ligaments are damaged and the joint is unstable. In rheumatoid patients there are significant deformities. A combination of staged procedures that include deformity correction, joint fusion and silastic flexible joint replacements will need to be considered. It is likely that pain may lessen with time and a functional range of motion may be maintained. The symptoms may resolve to such an extent that the patient may be able to cope with the residual lack of movement. However most patients will find that their symptoms will increase with time, and that they need further treatment. Each of the surgical treatments is successful in achieving pain relief. Fusion of the joint will lead to a pain-free stable joint in more than 95% of patients. Joint replacement surgery will also lead to a pain-free joint with the advantage of maintaining a functional range of movement within that joint. It is difficult to predict how much range of motion will be achieved. The surgical scar may be tender for a few weeks but will nearly always settle. There is a small possibility that the scar may remain unattractive. An area of numbness can occur around the scar but this does not cause any problems. Infection is possible but usually can be successfully treated with antibiotics. Very rarely infection may spread into the joint replacement. In the long term the finger joint replacements may fail and will need to be revised to a fusion or another replacement. It is expected that nearly 80% of the finger joint replacements will still be working after 10 years in low demand patients. The bones may fail to unite when fusion is attempted. Implants that are used to achieve fusion may cause irritation and need removal. After the operation, the therapist will show you exercises for the hand. You may be given a splint depending on the nature of your operation. It is important to do the prescribed exercises regularly, both during the physiotherapy sessions and at home. It will help to keep the pain levels down with analgesics, so as to keep your hand moving. It is not advisable to wear rings on the operated side for 4-6 weeks after surgery. Following excision of nodes / cyst you should be able to return to the desk job within a few days. Following joint fusion or replacement you will be able to return to a desk job and perform reasonable tasks with the limb by 4-6 weeks. Manual work after surgery should be avoided for 8-12 weeks. It is not recommended after joint replacements. Driving should be possible within a week of excision of nodes / cyst but may take 4-6 weeks for the other types of operation.